A wet and dreary day on the Queen's Birthday public holiday didn't stop Aquis Farm trainer Steve O'Dea from making the most of his four runners at Eagle Farm, ending the day with two wins and a second placing, all with jockey Paul Hammersley. The race day kicked off for O'Dea with Proven Thoroughbreds' owned Sornja, by Real Saga, having just her second career start. 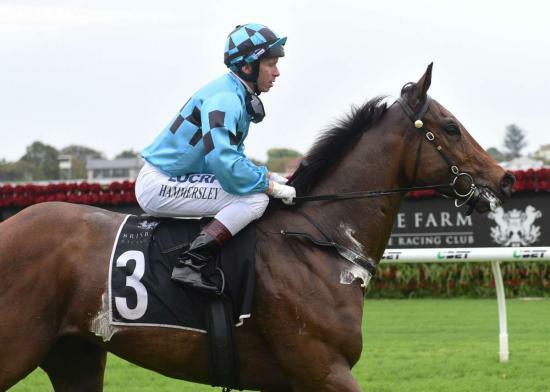 Only eight days after running third on debut at the Sunshine Coast, Sornja ran home strongly to place second by the small margin of a long neck. A fantastic effort for the three year old filly's second attempt at racing. The first win of the day came with Aquis Farm owned Snippetson gelding So Miraggio (pictured). Not having raced for 30 days, So Miraggio settled in third position, but soon made his way to the front on the turn and stayed there, winning by 1.3 lengths. Trained at Aquis Farm's private Canungra facility, So Miraggio has now won three of his four starts, and all by generous margins. To finish off the day, the Lavin Park owned Butcher Blue managed to complete his own hat trick, coming off the back of two straight wins previously. He has now been with O'Dea for five starts, and has amazingly won four of those starts. From his past ten runners, O'Dea's statistics are extremely impressive. Four wins, four seconds and a third; only one horse unplaced in his last ten starters. The results speak for themselves, indicating that the Aquis Farm system of working between the Aquis Farm Canungra property and the Eagle Farm on course stables is bringing out the best in the team.